Aaaah, that was a good and satisfying laugh, and I can’t stop smiling. A good beginning for this day. Thanks Christopher! So it seems Joyce’s kids have their own lives and Ireland won’t have snakes …for now at least. Dear Bikkie! I’m not exactly sure I can describe (even for myself) what his voice sounds like, but I can ‘hear’ it when read his comments. In fact, it occurred to me that each of the characters has their own voice in my mind. It’s a sure sign of a good writer when that happens. Your characters truly come to life. Joyce sounds like Bea Arthur. Devyat sounds like Aubrey Plaza. I did it, I’ve caught up! 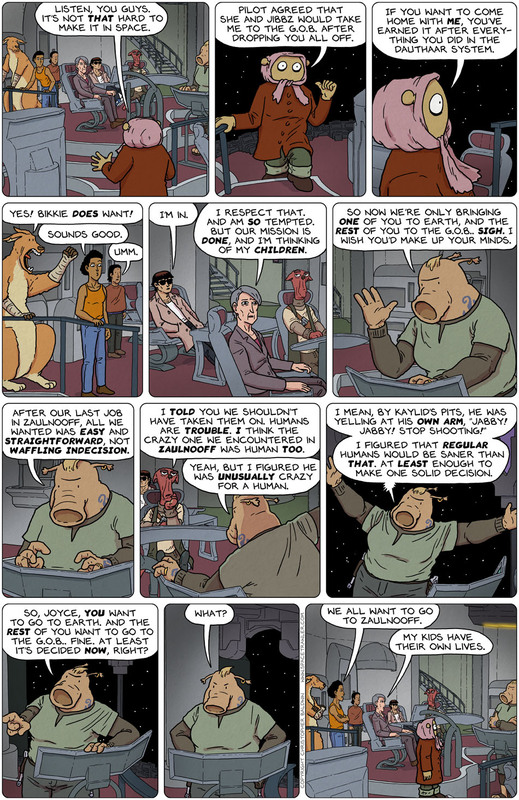 Through the original Spacetrawler and Anna Galactica and now up to the current comic-and I loved every bit of it, man this is a fantastic webcomic! Christopher Baldwin, you are officially my hero. Also, really glad to see that Coyote is still here making comments-each strip I would scroll down just to read Coyote’s snarky remarks; keep it up! Kaylid’s Pits are the Brogram’s Teeth of Khsqzrdhkfg’s Nosefunnel? Set course for Ridiculopathy!! Warp factor —— TWICE!!!! Um… you mean this in a smiling GOOD way, yes? I totally want to go to Zaulnooff too! Is there room for one more on board? Don’t worry. There’s room for all of us! Do you think they were going without us? Fat chance if they thought so. And an adventure pops up. And Joyce easily changes her mind about Earth. I don’t think she really wanted to go back, but assumed everyone else did and made an excuse for their sake. She welcomed an opportunity to go back on going back.